Posted by Web Administrator on July 21, 2017 under Sustainable Mountain Development. The African continent is endowed with mountains of high productivity, biodiversity, endemism, and cultural diversity. African mountain ecosystems play an important role in economic development, poverty alleviation, and environmental protection. However, climate change and extreme events, as well as human activities, alter the capacity of mountains to provide such services to millions of Africans who depend on them. Since the creation in 1995 of the Albertine Rift Conservation Society (ARCOS Network), mountains have been at the core of its programs, and collaboration among stakeholders is a key aspect of its search for sustainable solutions to threats affecting African mountains. The Albertine Rift Conservation Society (ARCOS) is a non-governmental organization (NGO) established in 1995 that originally focused on the rich mountain ecosystems of the Albertine Rift region; but has now expanded its area of operation to cover all African mountains. ARCOS is implementing a global mountains program (Sustainable Mountain Development for Global Change or SMD4GC) in Africa. As a sustainable mountain development (SMD) hub for Africa, ARCOS partners with stakeholders, including NGOs, governments, community-based organizations, and the private sector, to enhance and maintain the health of African mountain ecosystems, which are key features in the economic development of African countries as well as the wellbeing of their people. In 1999, ARCOS organized the first Albertine Rift Regional Mountain Forum. Since then, it has been bringing different stakeholders together to discuss and frame a shared mountain agenda for Africa. The current SMD efforts in Africa build on the existing stakeholders’ efforts and focus on knowledge sharing to guide decision-making and dialogue to explore future challenges and opportunities for SMD with reference to global development agendas, especially Agenda 2030 and global agreements on climate change. ARCOS believes that SMD in Africa will be achieved through developing and strengthening policy and institutional arrangements and mechanisms for enhanced governance in mountain ecosystems, increasing investment in mountain development and conservation, enhancing mountain ecosystems and the participation of mountain communities, and implementing adaptation measures to address the impacts of climate change in mountain areas. In 2014, ARCOS and the East African Community organized the first African Regional Mountains Forum (http://events.arcosnetwork.org/), held in Arusha, Tanzania. The forum called upon member states to develop and implement a shared mountain agenda and strategy for Africa. In addition to the 2014 Arusha forum, there have been several other calls to action reiterating the need to strengthen mountain governance and to enhance cooperative action in mountain regions at various levels. These include the 2013 African Ministerial Conference on the Environment, the Africa Mountain Partnership Members Meeting held in Kigali, Rwanda, in February 2013, the Regional Conference on African Mountain Ecosystems as Impacted by Climate Change: Post RIO 20 Actions, held in Nairobi, Kenya, in September 2013, the Meeting on Sustainable Mountain Development in African Mountains, held in November 2011 in Mbale, Uganda, and the Gaborone Declaration on Climate Change and Africa’s Development in March 2015 (The Republic of Botswana and Conservation International 2015). All emphasized the need to promote and strengthen SMD, including the adoption of transboundary and regional frameworks for the sustainable management of African mountain ecosystems. Building on these mandates, the call for strengthened management and conservation of mountain ecosystems was reinforced at the 15th session of the African Ministerial Conference on the Environment in Cairo, Egypt, which called for the strengthening of the Africa Regional Mountains Forum as a center of knowledge, information exchange, and policy dialogue. ARCOS is the interim secretariat of this forum. 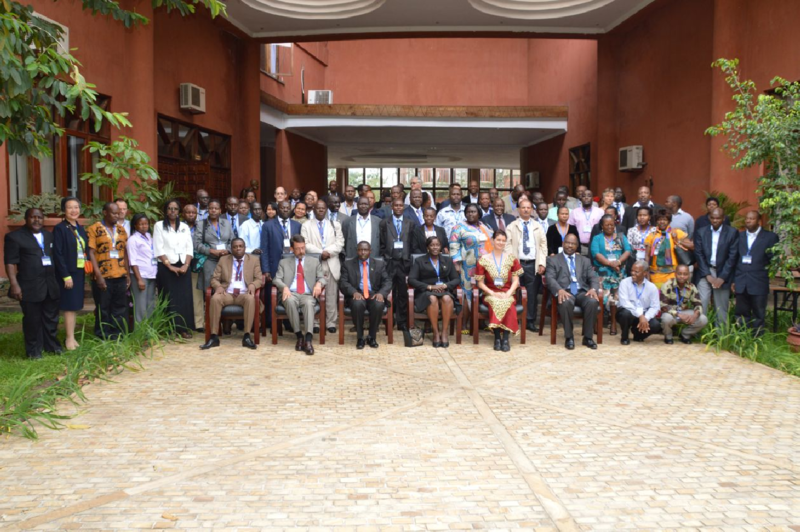 Later, countries in Africa started developing National Sustainable Mountain Development Strategies. These include Madagascar in 2015 and Uganda in 2016 (MWE 2016); both countries’ strategies are already being implemented. Other collaborative efforts that are important to protecting Africa’s mountain resources include the Greater Virunga Transboundary Collaboration Agreement, signed by the Democratic Republic of the Congo, Rwanda, and Uganda on 22 September 2015, and the agreement between ARCOS and the East African Community, signed on 27 July 2015, to collaborate in promoting SMD in East Africa. 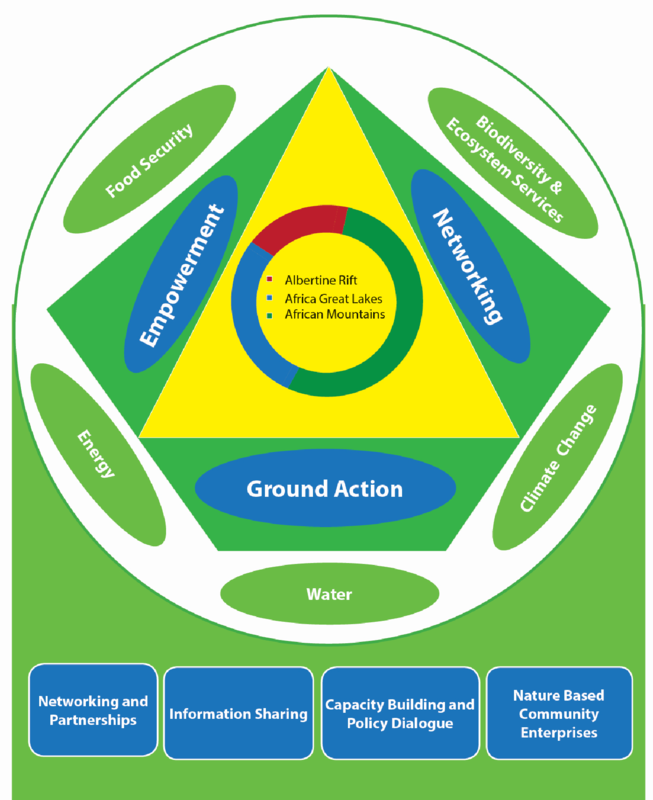 The World Mountain Forum 2016—organized by ARCOS, the government of Uganda, and other partners and held in Uganda at Mbale on 17–20 October 2016, with the theme Mountains for Our Future— and its main outcome document, Don’t Leave Mountains Behind (WMF 2016), also emphasized the need for wise policymaking and decision making about mountain ecosystems. The 2016 World Mountain Forum’s outcome document called on governments, politicians, decision-makers, development and multilateral agencies, financing institutions, and mountain stakeholders to form policy, gather knowledge, and take action on reaching the targets of the Paris Agreement on climate change and the Sustainable Development Goals through specific attention to mountain regions; recognize upstream and downstream links, especially with regard to mountain ecosystem services; speak with one global mountain voice; and promote the inclusion of mountains in international processes and negotiations. As knowledge is key to informed decisions, ARCOS developed an online platform, the ARCOS Biodiversity Information Management System (http://arbims. arcosnetwork.org/), to facilitate information sharing on issues pertaining to SMD. In the same framework, stakeholders also joined hands to enhance knowledge of Africa’s mountains by collecting and packaging information. Those include, among others, ARCOS’s Africa Mountains Status Report (Alweny et al 2014), the Africa Mountains Atlas, published by the United Nations Environment Programme (UNEP 2014), and Sustainable Mountain Development in East Africa in a Changing Climate (EAC et al 2016). Finally, ARCOS’s experts have contributed to various international publications, such as ‘‘The science-policy dialogue for climate change adaptation in mountain regions’’ (Kohler et al 2016), providing input on Africa. These publications provide evidence and help guide decision-making about African mountains. ARCOS and its partners are committed to finding sustainable solutions to key SMD challenges in Africa identified during the Africa Mountains Event that preceded the 2016 World Mountain Forum. Those challenges include limited investment in SMD and limited consideration of mountains in national development plans as well as the vulnerability of mountain communities to climate change. All those hinder the development of mountain areas as well as the development of a country as a whole. Everyone has a role to play in SMD, which is the factor that will determine our future. ARCOS encourages the ongoing SMD interventions and calls for support for the Africa Sustainable Mountain Development Fund, launched during the Africa Regional Mountain Forum. Politicians, decision-makers, the media, and the public should join voices and advocate for recognition of mountains as a key context of sustainable development, especially for Africa. Water availability will be determined by how we care about the world’s water towers— mountains (ARCOS Network et al 2013). Africans should also join forces to call for mountains to be given special attention in global financing mechanisms as relevant areas in which to tackle climate change and strategic places in which to eradicate poverty in Africa. Please, download a pdf copy of the publication here.